March is kids month at Rom Family Chiropractic!! All month long we will be featuring topics that are important for raising healthy kids AND helping the whole family! Today we are going to talk about chronic ear infections, or otitis media, which can be frustrating for both a child and their parents. 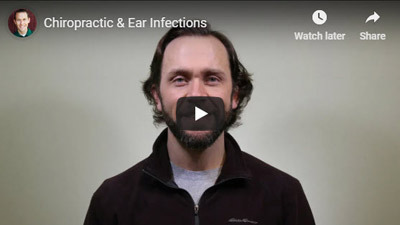 While the child is dealing with the painful inflammation and fluid build-up in the middle ear, many parents find it challenging to decide the best treatment and course of action. Ear infections are the most common reason parents bring their kids to the doctor. Nearly five out of six children will experience at least one ear infection by their 3rd birthday. There are a few reasons why kids tend to get more ear infections than adults. The American Academy of Pediatrics discourages jumping into prescription antibiotics right away. By exploring natural remedies and treatments, many children can overcome ear infections without the side-effects associated with repetitive antibiotic use. Day 1 – All the red, blue and green bars indicate a severe level of inflammation and nerve interference (subluxation). The patient was examined and given a Chiropractic adjustment. Day 2 – Significant improvement symptomatically as well as in the thermography scan. Even though the patient was feeling much better, the scans indicate the need for another Chiropractic adjustment. The patient was once again adjusted. Day 3 – Symptoms and underlying nerve interference and inflammation had resolved. If your child, or someone you know has been suffering from chronic ear infections, you should get them checked by a chiropractor, we’ve helped many kids with these types of issues and we’d be happy to see if we can help you & your kids too! Also be sure to check out our upcoming Wellness Workshop: How to Raise Healthier Kids! and be sure to call the office to register and save a seat TODAY!